A new diagram relationship needs to be introduced. In Chapter 1, the diagrams included Generalization and Composition relationships. The diagrams below will use a new Aggregate or Reference relationship which is indicated by an empty diamond. This relationship does not indicate ownership, but only a reference to another element. 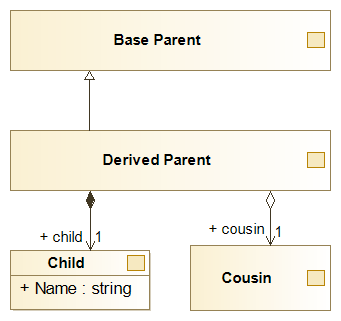 In the example below, Derived Parent has an Aggregate relationship to Cousin. It doesn’t own Cousin like it does Child, but there is a familial connection. Additionally, we have introduced a name Property for Child. Properties customize individual instances of the block elements. As you may have discovered researching DMR, a unique identifier  is required to talk on a DMR network. This ID is analogous to your call sign but is only used for DMR. RadioID.net, the current DMR ID registrar, allows users to request two DMR IDs without special justification. Under normal circumstances, one DMR ID is sufficient, but there are times which multiple IDs may be desired. As a result, DMR radios are capable of storing many IDs. 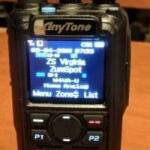 My Anytone for example can store up to 250 DMR IDs. IDs are simple elements and only require an Index, Name and Number properties. Note, all elements that occur in lists will include an Index property. It’s time to circle back around to Channels and start linking together the concepts we have learned so far. As discussed previously, the Channel contains the station information such as operational frequencies, bandwidth, signal power, etc. Let’s start with the details of an Analog Channel and how it is captured in the model. The base Channel element is composed of properties that are common to both Analog and Digital Channels. This base Channel is extended to create an Analog Channel element, which adds familiar properties such as Tone Mode, CTCSS codes, DCS codes, etc. 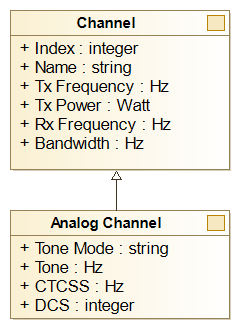 The Analog Channel element inherits all properties from the base Channel element. Digital Channels require a few new properties and two existing properties discussed earlier. The first new property is Time Slot. As you have likely learned from other resources already, DMR transmissions use Time Domain Multiple Access (TDMA) to enable two simultaneous conversations to share the same frequency. The Time Slot property specifies which time slot is to be used. The second new property is Color Code. Color Code is very similar to the concept of CTCSS or DCS modes. But unlike in Analog Channels using CTCSS, Digital Channels must specify a Color Code, it is not optional. The valid range for Color Codes is 1 through 8. The last new property is Tx Permit. This specifies when the radio is allowed to transmit and is used to play nice with others. Two common values are ‘Always’ and ‘Color Code Free’. Always is used for simplex while Color Code Free is the preferred qualifier for shared repeater access. The two existing properties are DMR ID and TalkGroup. 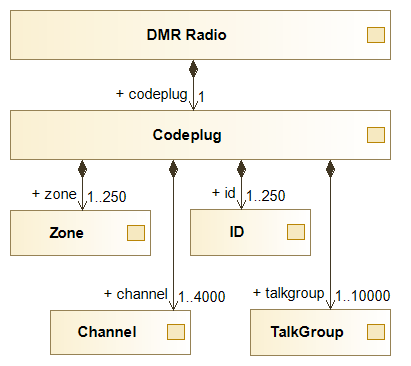 Unlike other properties, the desired Digital Channel DMR ID and TalkGroup must be referenced from aforementioned Codeplug lists. This concept is illustrated in the diagram below. 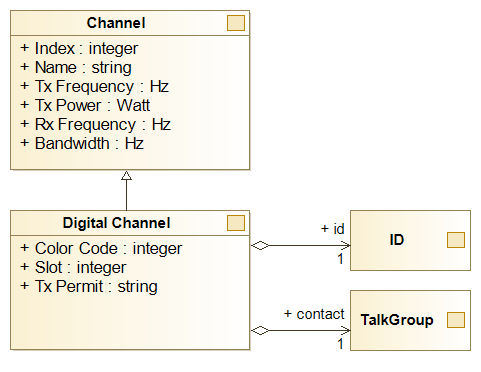 Time Slot and Color Code are local properties to the Digital Channel, but TalkGroup and ID are references to other elements in the Codeplug. TalkGroups are simple in comparison to Channels. They only require four properties, Index Name, DMR ID and Call Type. The ID property is named the same as in the ID element because there is an overlap between the two IDs. For now, just realize there all participants in a DMR QSO including the TalkGroup have an ID on the network. The last property is Call Type and is either Group Call or Private Call. For most amateur radio activities this will be Group Call. Special Private Call cases will be covered later. Once IDs, TalkGroups, and Channels are entered into the Codeplug, Zones can begin to take form. 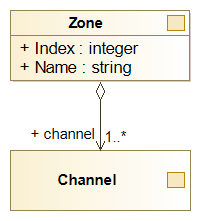 The Zone element contains both index and name properties in addition to a reference link to the available Analog and Digital Channels. A Zone may contain a link to one or more Channels. It is common to create Zones for geographical regions in Analog Only, Digital Only and Mixed configurations. We’ll address this in more detail in future chapters. 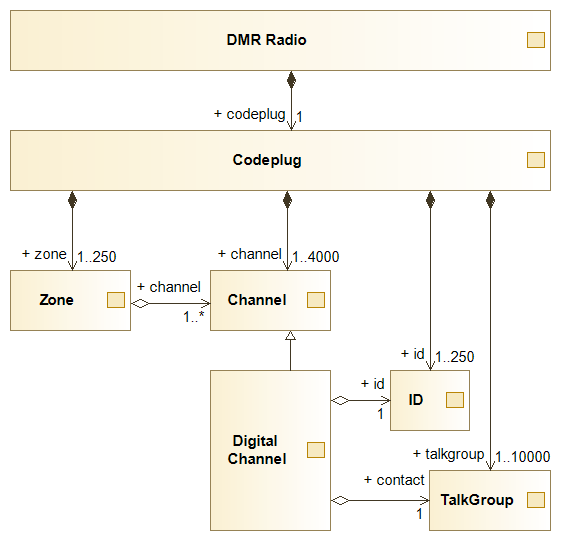 In these first two articles, an initial landscape of basic DMR codeplug concepts have been presented. The DMR Radio requires a Codeplug. The Codeplug is composed of IDs, Zones, TalkGroups and Channels. Channels contain the properties for stations and Digital Channels are linked to IDs and TalkGroups. Zones are composed of the available Channels. The next installment will walk through a detailed example with Analog and Digital Channels applicable to our local area. About the Author: Richard Ferguson is a recent addition to Amatuer Radio community receiving his first licence is January of 2018. He has since earned his Extra class license and is fully engaged in many aspects of the radio hobby including contesting, antenna construction, APRS, and utility development. In his professional career, Richard is a Systems Engineer with 20 years of experience in embedded systems and ASIC design and manufacturing.